Refrain First Line: Alleluia! Alleluia! After the great “Hall of Faith” passage in Hebrews 11, the writer to the Hebrews calls the saints who are still on earth to emulate those who have gone before: “Therefore, since we are surrounded by so great a cloud of witnesses, let us also lay aside every weight, and sin which clings so closely, and let us run with endurance the race that is set before us …” (Hebrews 12:1, ESV). What were the accomplishments of this “great cloud of witnesses?” They “… conquered kingdoms, enforced justice, obtained promises, … quenched the power of fire, escaped the edge of the sword, were made strong out of weakness …” (Hebrews 11:33-34, ESV). That sounds rather glamorous! But “Others suffered mocking and flogging, and even chains and imprisonment. They were stoned, they were sawn in two, they were killed with the sword” (Hebrews 11:36-37, ESV). What a contrast! The stanzas of the hymn “For All the Saints” describe the common life of all the saints: the credit due to Jesus Christ for drawing us all to Him, the strength and guidance we continue to draw from Him, our joint communion in Christ, the continuing struggle against evil, and the coming day when the dead shall rise and we shall all worship together before God the Father, Son and Holy Spirit. No matter what path each of us travels, we all will enjoy the same glorious eternal life. 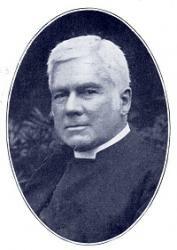 This text was written by William W. How, a bishop of the Anglican Church, and first published in Horatio Nelson's Hymns for Saints' Days in 1864. There is considerable variance between hymnals as to which of the eleven original stanzas are included (typically six to eight are selected). Two things are universally agreed upon: that the first two of the original stanzas are always included (“For all the saints” and “Thou wast their rock”), and the original fourth and fifth are never sung. 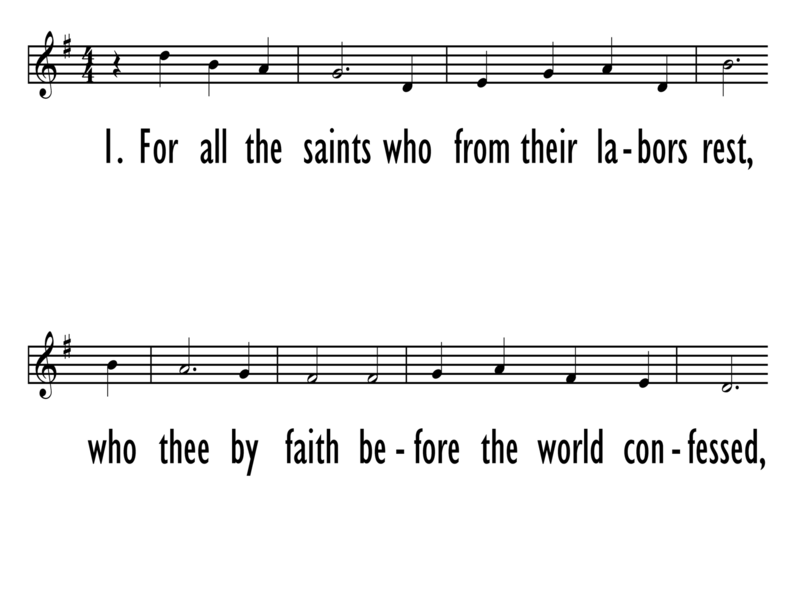 Two more things are agreed upon with rare exception: that the original third stanza is omitted (“For the Apostles”), and that the last stanza is included (“From earth's wide bounds”). There is considerable variance on which of the remaining five original stanzas are sung. There are also differences in wording between different hymnals. Some merely modernize the language (i.e., “Thou wast their rock” becomes “You were their rock”). Other changes, as well as the choice of which stanzas to include, appear to reflect a desire to slightly soften the theme of the Church militant, which is heavily present in the text. 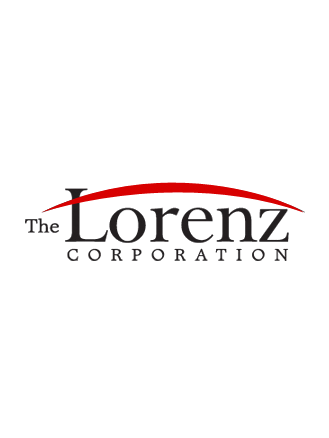 In modern hymnals, this text is paired with SINE NOMINE, written for this text in 1906 by Ralph Vaughan Williams, the well-known English composer. He wrote harmonizations for both unison singing and four-part harmony. The title SINE NOMINE means “without a name” in Latin; it may refer to the many saints whose names are known only to God (The New Century Hymnal Companion, ed. Kristin L. Forman, 361). Before SINE NOMINE was composed, the most popular tune was SARUM, written in 1868 by Joseph Barnby, but this has fallen out of favor and almost never appears in modern hymnals. A third tune that this text is sometimes sung with is ENGELBERG, which is more commonly associated with the text “When in Our Music God Is Glorified.” ENGELBERG was composed for “For All the Saints” in 1904 by Charles Stanford, who was one of Ralph Vaughan Williams' teachers. 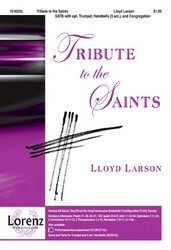 Lloyd Larson has written a dramatic setting with this tune, titled “Tribute to the Saints”, which could be used as a choral anthem or as a congregational hymn. This hymn is traditionally sung for All Saints' Day, for funerals, or for services on the theme of the Church triumphant. How this hymn is presented may depend on the occasion. Because the hymn is longer than is typical, try adding some variety to how it is sung. Since Vaughan Williams originally wrote two settings, it would be a good idea to sing some stanzas in unison and others in harmony. Without a choir, the congregation can also be divided into two groups singing antiphonally as the “heavenly” choir and the “earthly” choir (Emily R. Brink and Bert Polman, eds., Psalter Hymnal Handbook, 677). The choir could also be one antiphonal group while the congregation is another. Display Title: For all the saints First Line: For all the saints, who from their labors rest Tune Title: SINE NOMINE Author: William W. How Date: 1992 Source: Hymns for Saints' Days, and other Hymns, 1864, alt. Display Title: SINE NOMINE First Line: For all the saints, who from their labors rest Tune Title: SINE NOMINE Author: William W. How Meter: 10s. Date: 2012 Source: From the 1941 SDA "Church Hymnal."